Valuable insight on environmental and sustainability priorities that looks at how beauty companies are deploying initiatives to drive change in a resource-constrained world. The sustainability consulting group Quantis is pleased to release the report “Beauty Faces up to Sustainability”. 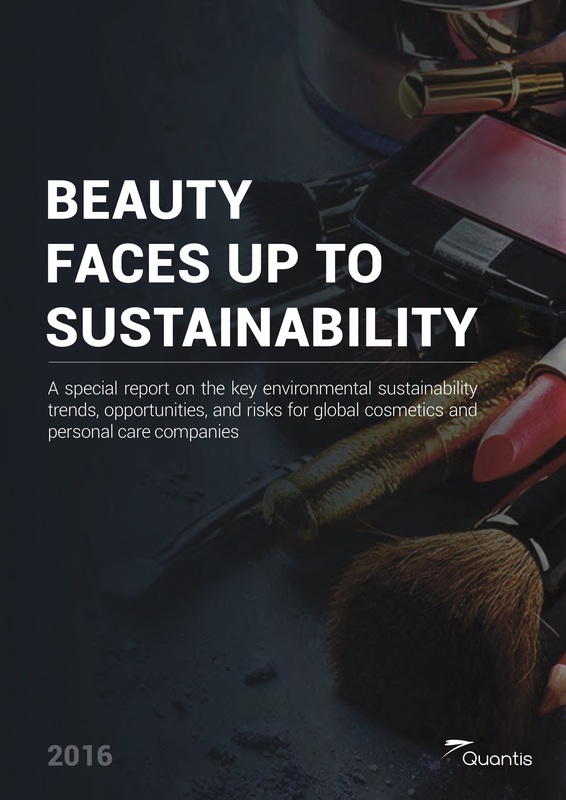 In this special report, Quantis offers valuable insight into the key environmental sustainability trends, opportunities, and risks impacting the strategies and operations of global cosmetics and personal care companies. With sales of beauty products expected to rise 6% to $675bn by 2020, according to Reuters, cosmetics and personal care companies must prepare to transition to the new global economy. Creating resilient, transparent and sustainable business models - based on relevant metrics – is a key step to ensuring these global operations survive in a resource-constrained world. "Given the stakes at hand, smart companies - 75% of those surveyed - are measuring their environmental impacts with metrics in order to tackle these issues. This enables them to embed sustainability in their daily operations and to make strategic decisions based on facts." Quantis Senior Consultant and principal report author Annabelle Stamm explains. "Some are also deploying stakeholder engagement and communication initiatives to inform and educate to drive sustainable change." The brands and organizations featured in the report include: Aveda, Biotherm, CDP, Chanel, Colgate-Palmolive, Dow Chemical Company, DSM, Estée Lauder Companies, EU Commission, Firmenich, Grupo Boticário, Henkel, Johnson & Johnson, Kao Corporation, L’Oréal, Lush, M-A-C, Method, Natura Cosméticos, Newlight Technologies, Oriflame, Personal Care Products Council, Proctor & Gamble, UN Global Impact, Unilever, WRI and WWF. The goal of the report is to draw on Quantis’ expertise in the industry gained from working with the fields leading organizations. 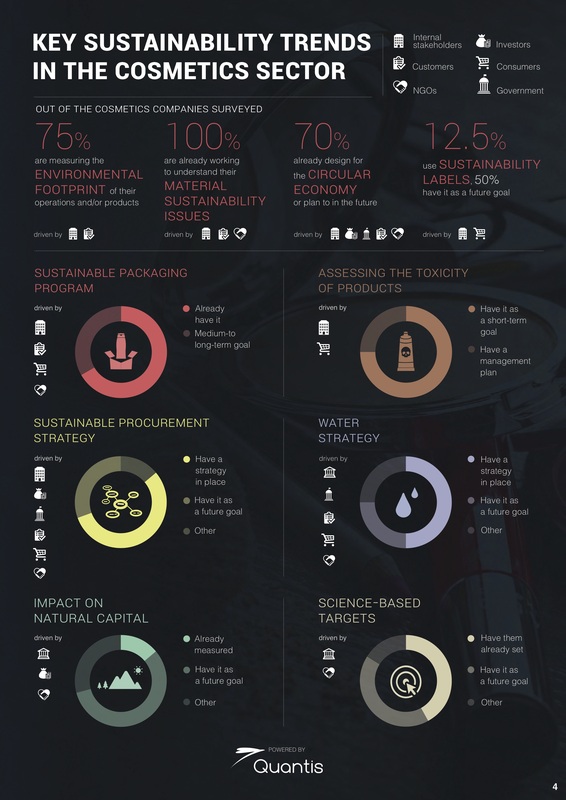 The report aims to provide examples of trends, actions and best practices to be used as a guide to sustainability, brand, communications & marketing managers - or any function confronted with sustainability challenges - so they can have a clear understanding of the industry’s challenges in order to take the next step on their sustainability journey. Quantis is a global leader in sustainability and Life Cycle Assessment (LCA) expertise, services, consulting and tools. Quantis is specialized in supporting companies as they measure, understand and manage the environmental impacts of their products, services and operations. Quantis is a trusted partner for organizations across industry sectors, such as RIO 2016, Nestlé, AccorHotels, Intel, Mars, Mondelez, General Mills, Danone, L’Oréal, Firmenich, Kraft, European Commission, WRI, Lenzing, Hugo Boss, and The European Space Agency.